Remember when you were a child and the holiday parties were always filled with your favorite cookies and candies? I sure do! Being gluten-free put a bit of a damper on that for me which is compounded by the fact that I’m not all that into baking. If you’re like me, you may opt this year for some pre-made goodies to serve at a party that are gluten-free, yummy and satisfy the sweet cravings of even those non-GF party-goers in attendance. Just about everyone loves mixed nuts at parties, so why not add some dark chocolate into the mix? Taza Chocolate offers delicately roasted hazelnuts, cashews and almonds paired with some seriously fine dark chocolate. These gluten-free nutty treats are a perfect addition to the dessert table. Rich, incredibly addictive and just so darn good, you’ll love these nuts a little more with each bite. Personal fav: Chocolate Covered Cashews — The most incredible mix of chocolaty-salty-nutty goodness ever! If you miss the good ol’ days of the creme-filled cookies, then you’ve got to check these gluten-free delights from Jovial. A slightly crunchy outer cookie leads to a delicious inner treat of either vanilla creme, chocolate creme, or fig (just like a fig newton!). These cookies come in little single serving packs of two which make them perfect for adding a lovely surprise to someone’s lunch or a nice post dinner treat. Personal fav: Chocolate Vanilla Creme-filled Cookie — A lovely blend of the two flavors that’s not overly sweet, but definitely flavor-packed. 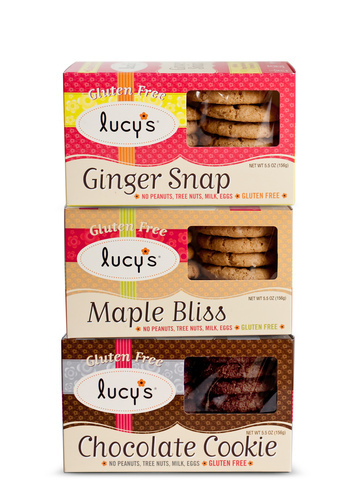 Allergen-friendly, vegan and gluten-free, Lucy’s Cookies are a great option for guests with multiple food allergies. With their seven different flavors, you’re sure to have a nice mix of crunchy cookies that everyone can enjoy. Pick from popular favorites like Cinnamon Thin, Sugar, Chocolate Chip, and Oatmeal. Or indulge in their new line of Ginger Snap, Maple Bliss and Chocolate. Either way, you’re sure to find a favorite that also boast being non-GMO, no peanuts and no tree nuts. Personal fav: Maple Bliss — Perfect blend of flavors that conjures up happy memories of eating a hot bowl of oatmeal sweetened with brown sugar and maple syrup on a cold winter’s day. These big, firm cookies just scream at you “Make me into a cookie sandwich!” From Glow Gluten Free Cookies, these cookies are probably some of the best on the gluten-free market. They’re so seriously good that you and your guests probably would never guess they were gluten-free. Classic cookies that grandmothers love to make at the holidays, Glow Gluten Free Cookies are also casein- and preservative-free. You’ll end up a raving fan, just like everyone else I know whose had the pleasure to sample them. Sweet! Personal fav: Gingersnap — Two snaps go out to Glow Gluten Free for their Gingersnap cookies. By far, the best gluten-free gingersnap on the market.